As the size of the event increases, so usually do the power requirements. 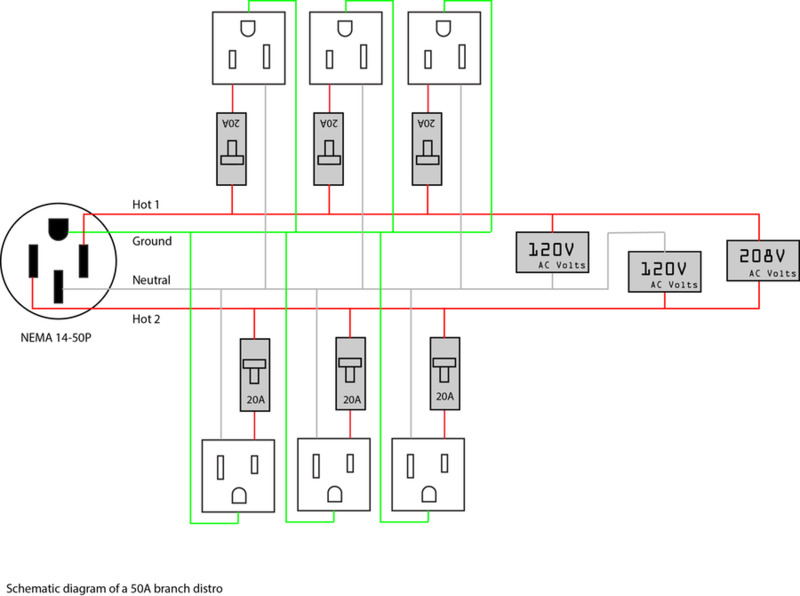 The Poor Man’s Distro concept can help manage up to about 4 circuits sourced from around the room – assuming you can find that many, but that’s about it. Even finding two or three circuits may require long and inconvenient cable runs. It’s time for bigger guns. The National Electrical Code uses the phrase “cord and plug devices” to indicate devices that are allowed to be used by people who do not hold an electrician’s license. This includes regular Edison receptacles, the NEMA plug series, and a few other devices. This is a very important delineation. Unless you are a licensed electrician, you may not open a breaker panel, a junction box, or basically anything that requires a screwdriver. Sometimes we can be tempted to “make it work” to make the show go on. In some cases, this is an admirable sentiment. With regard to electricity, this is a foolish sentiment. Electricity is a very powerful unseen force. It is very easy to have a situation where equipment appears to be working, but in fact dangerous or deadly conditions are present, waiting for the right circumstances to reveal themselves. Do always test every receptacle you wish to use. Do not try to repair any venue equipment. Even if you know how to do something, you may not do so without a license. Even if you know how to do something and are licensed, you still may not do so without specific authorization by the venue. Do not break the “cord and plug” rule. If you need a screwdriver or other tool, you are probably not allowed to do it. If you touched it, you own it. Breaking the cord and plug rule and touching venue equipment– even if you improve the situation – makes you potentially liable for anything that happens at any point in the future, even if it wasn’t due to your work. Resist the temptation to put on a show larger than the venue can handle. Cutting corners – especially with electricity – is extremely unwise. It’s far better to say no to the event or scale back than to have to live with a serious accident or lawsuit. This article is intended to increase your knowledge of power distribution and the information herein is based on the NEC 2014 and is believed to be correct. This article is not intended to be a complete treatment on the matter, and does not constitute advice on how to build, install, or use an electrical system. Rather, this article seeks to identify and warn of various unsafe electrical situations and practices, and to point the reader to the National Electrical Code and the authority having jurisdiction for further information. Relevant NEC articles include: 240, 250, 400, 520. The author recommends that readers familiarize themselves with these sections of the code. A branch distribution system is a medium-sized power system that provides several 120V 20A circuits and is fed from some kind of high-current plug, commonly a NEMA 14-50 series device. In the example above, a 50A 208V (two legs of a 3-phase power system) or 240V (two legs of a single-phase system) supply is broken down into 6 20A circuits, 3 per leg. This configuration can supply up to 100A of 120V power. Operating a BCD (branch circuit distro) is intuitive. Plug the main cable into the appropriate high-current receptacle, turn on the branch circuit breakers, and connect your load. Most of the work in understanding a BCD relates to the available capacity of the system, and code elements that ensure safe operation. The rest of this article delves into fairly technical territory. This, unfortunately, is unavoidable, as an understanding of some basic electrical principles and code elements is a mandatory prerequisite for use of any kind of branch distribution system. What follows is an attempt at a layman’s paraphrase of the relevant issues, with code notations for further reading. Before selecting a BCD, it is wise to consider the power available at the venues you use as well as the capacity you are likely to need. By far the most commonly available supply is the NEMA 14-50, which can provide 6 20A 120V circuits. This is also the largest supply that is commonly found; needing more than 6 20A circuits usually pushes you into either multiple BCDs or larger distro systems. Unless you regularly work at venues with a different standard, the 50A NEMA 14-50 is the logial choice. Other systems such as the NEMA 14-30, NEMA L14-30, and NEMA L21-30 are reasonable choices for branches from a larger distro system, but are probably not large enough to be used as your only distro in a medium sized system. The California connector (Hubbell CS6365C/CS6364C) is equivalent to the NEMA 14-50 in capacity and function and is another good choice, providing a slightly different set of advantages and disadvantages. At first glance, building your own BCD may seem to be an economical option compared to the various commercial products out there. This is a false economy. There are many traps in building power distribution equipment, and once the cost of correct components and labor is considered, a home-made unit is not materially cheaper than purchasing from a reputable vendor. Furthermore, some jurisdictions require that power distribution equipment be “listed” by a national underwriter, such as UL or ETL. Purchasing from a vendor with listed products ensures your device is constructed correctly, and can be used in any situation. BCD device capacity is specified based on the size of the input breaker. Though the example BCD can theoretically supply up to 100A of 120V power, this device is considered to be a 50A device, as it is fed from a 50A supply. Many BCDs have more breakout capacity than input capacity. The example BCD supplies 3 20A circuits per leg, totaling 60A per leg, or 120A total. This capacity is not simultaneously available, as if the user attempts to draw 60A per leg, the main breaker of the BCD (if equipped) or the venue breaker supplying the BCD will trip when the load exceeds 50A, cutting power to the entire BCD. If any leg of the BCD exceeds the supply capacity, the entire BCD device will shut down. BCDs must be fed from common-trip breakers NEC 240.15, which means that if any leg exceeds the trip threshold, all legs will trip. For example, if one leg of the BCD has a 10A load and the other leg has a 60A load, the 60A load will cause the main breaker to trip, cutting off both the 60A load and the 10A load, even though there was extra capacity on the leg with a 10A load. For this reason and others, it is important to balance the load between all legs of the BCD. NEC table 400.5(A)(1) details the ratings for portable cord (SOOW or SEOW are the correct type for entertainment power cables NEC 520 IV, V). The number of current-carrying conductors affects the necessary size of the wire. Since the BCD will be supplying power to non-linear loads such as power amplifiers and lighting dimmers, the neutral wire must be counted as a current-carrying conductor. Column A lists the relevant ampacities. 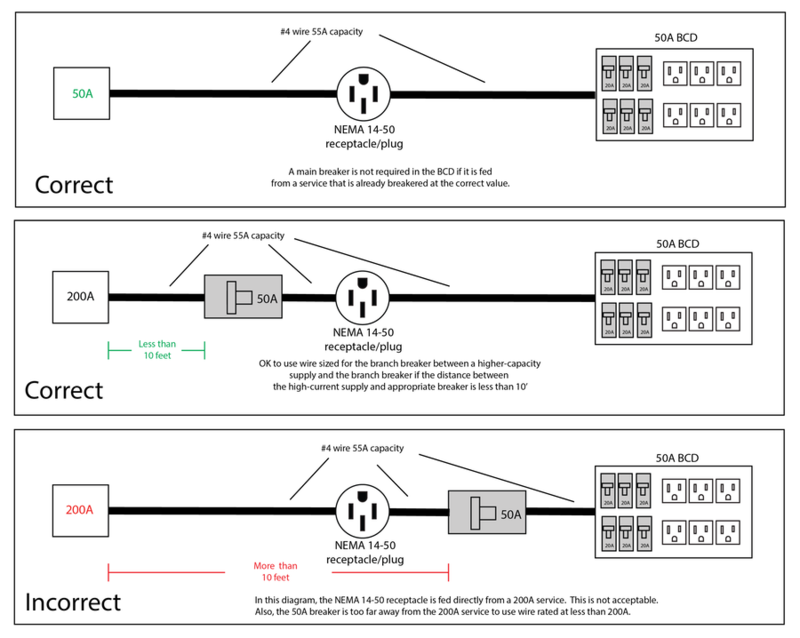 A 50A distro requires #4 wire. A 30A distro requires #8 wire. The vast majority of commercial buildings are supplied from a 3-phase electrical system, meaning that this condition almost always applies in our industry. The other significant reason to use the correct sized wire is to minimize voltage drop over the long cable lengths commonly used in our industry. A solid electrical supply is the lifeblood to the performance of our equipment. Low voltage robs audio equipment of headroom and output and may cause equipment to fail or restart. Trying to save a few dollars by undersizing cabling is a poor value. Every step down in current capacity requires an appropriate circuit breaker upstream of the step down NEC 240.21. For example, the #4 wire supplying the example 50A BCD must be protected at the supply end by a 50A OCPD. It is not acceptable to tie #4 wire to a 200A service and have the 50A breaker be at the load end of the #4 cable. The reason for this is that a fault could develop in the #4 supply cable and up to 200A could flow before the upstream breaker would trip – more than enough to create a fire hazard on #4 wire. There is one exception – it is acceptable to use a smaller size cable than the service (The NEC calls this a “tap” NEC 240.21(B)) if the tap cabling is appropriate for the size of the downstream breaker AND the length of the tap is less than 10’ NEC 240.21(B)(1). You will likely find yourself in situations where the high-current receptacle at the venue does not match your equipment. Depending on the circumstances, you may still be able to use that power. The two relevant factors are the value of the circuit breaker protecting the venue receptacle, and the receptacle’s type of conductors. There are many different types of receptacles, and many of these are organized by NEMA ratings. A NEMA rating has two components. The first number is the NEMA series, which indicates the electrical configuration of the receptacle. The second number is the ampacity of the receptacle. We have been discussing the NEMA 14-50 plug and receptacle. NEMA series 14 indicates the device is intended for 120V/240V operation (or 208V operation when supplied by a 3-phase system), and contains the following conductors – two phase legs (hot legs), a neutral conductor, and a ground conductor. “50” indicates that the device is a 50A device. Some devices are preceded by an “L” designation, indicating that it is a locking device. In some cases, it is possible to adapt one NEMA series to another, however care must be taken to make sure that the right type of conductors are available. For example, it is possible to make an adapter consisting of a male L21-30 plug (3-phase 120V/208V device with three hot legs, a neutral, and ground) to a female L14-30 receptacle (120V/208V device with two hot legs, a neutral, and a ground). It is not acceptable to make an adapter consisting of a male NEMA 10-50 (obsolete device with two hot legs and a neutral; this device has no ground conductor) to a female NEMA 14-50, because the NEMA 14-50 requires both a neutral and ground wire. NEC 240.21 states that conductors must be protected by an appropriately sized circuit breaker. If the venue receptacle is correctly protected by an appropriately sized circuit breaker and if this circuit breaker is equal or smaller than the designed ampacity of your BCD, you may potentially still use this receptacle; as you are attaching equipment rated for higher ampacity than the venue supply, and the venue circuit breaker will correctly protect your distribution equipment in the event of the fault. For example, it is acceptable to connect a 50A BCD to a 30A receptacle protected by a 30A circuit breaker. You may be able to use a venue receptacle of higher ampacity than your equipment if you use a circuit breaker that is appropriate for your BCD connected to the venue receptacle by a short tap cable (less than 10’). Any adapter with a larger-ampacity male plug to a smaller ampacity female receptacle (may be acceptable if an inline breaker at the smaller ampacity is used). Unacceptable adapters include NEMA 14-50P -> NEMA L14-30R, NEMA L14-30P -> L14-20R, etc. Branch circuit distribution equipment is an economical way to get more power than what is available from a couple Edison circuits. A 50A BCD with either a NEMA 14-50 plug or a CS6365C plug provides the best combination of available power, value, and compatibility with venue receptacles. When choosing wire size to supply your BCD, the neutral wire must be counted as a current-carrying conductor. #4 wire is the correct size for a 50A BCD. #8 wire is the correct size for a 30A BCD. Adapting to a venue supply that doesn’t match your BCD may be possible, but care must be taken to ensure that all devices are protected by appropriately sized circuit breakers and that supply configuration and voltage is compatible with your BCD.